There's a stigma that head lice - parasites about the size of a small ant - only affect unkempt children from low-income households. But that's not true, according to Dr. Silecchia. "Head lice cross all socio-economic groups. It has nothing to do a child's hygiene or how frequently the hair is washed," said Dr. Silecchia. "Lice are very contagious and pass from one person to another through physical contact. This is why it is very prevalent in schools where kids are constantly in close contact with each other." The most common symptom of lice is an itchy scalp. When checking for lice, parents should look for little round nits (eggs) that are on the hair shaft close to the scalp. Nits are dandruff-like in appearance. To distinguish them from dandruff or hair spray, pick up a strand of hair close to the scalp and pull a fingernail across the area where the whitish substance appears. Dandruff or hair spray will come off easily, but nits will stay firmly attached to the hair. 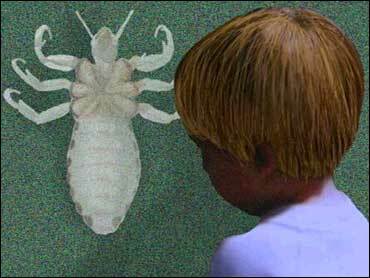 The best place to look for head lice is behind the ears, on the nape of the neck and in the scalp. Parents should make a habit of checking their children especially if school officials notify them of an outbreak. There are several prescribed and over-the-counter shampoos that get rid of lice. Permethrin 1percent cream rinse (Nix), is a topical pediculocide and ovicide for the treatment of head lice and eggs. It is applied to the scalp and hair and left on for 10 minutes before it is rinsed off with water. Synergized pyrethrins (A-200 Pyrinate, Pyrinyl and Rid) are over-the-counter products that are applied undiluted until the infested areas are entirely wet. But it is very important that parents follow the directions closely. The shampoos will typically eliminate any live lice within 24 hours. "Lately, we have seen some cases where the lice seem to be immune to these shampoos," said Dr. Silecchia. "If you believe this is the case, try another shampoo and remember again to follow the directions exactly as they appear on the label. In some cases, parents may think the lice is resistant to the shampoo when in fact it was just applied improperly." Parents should also use a nit comb to remove the eggs. Many schools have "no nit" policies that prevent children from going back to school before all the lice and their eggs are gone. However, the American Academy of Pediatrics is advising against that practice. "There's really no reason why a child should miss more than a day of school for head lice," said Dr. Silecchia. "If the medicated shampoo is applied properly, the lice should be dead within 24 hours." Pink-eye (or conjunctivitis) is also easily spread among children. The illness is the inflammation of the membrane that lines the eyelids and covers the exposed surface of the eyeball. Allergies, bacteria, viruses, chemicals or underlying health conditions can cause conjunctivitis. The symptoms of conjunctivitis are: eye pain, swelling of the eye, redness in the eye and yellow, green or watery discharge from the eye which collects overnight and crusts over the eye. "It can be treated with an antibacterial," said Dr. Silecchia. "It's very important for parents to catch it early because it is very contagious." Antibiotic medication, usually in the form of eye drops, is effective for treating many conjunctivitis cases. A child should stay home from school until all the symptoms have subsided. This can take two or three days. One of the more serious illnesses that children can contract at school is chicken pox. Chicken pox is a generalized infection caused by the varicella zoster virus. It is an extremely contagious disease that is characterized by a blistery rash. It occurs most frequently in children between the ages of five and eight. Fewer than 20 percent of all cases in the U.S. affect people over the age of 15. Chicken pox is transmitted so easily that almost everyone gets the disease. It is contracted by touching an infected person's blisters or anything that has been contaminated by contact with them. The virus is also thought by some researchers to be airborne since it may be caught from an infected person before the rash develops. Another way to get chicken pox is by exposure to shingles, a localized rash caused by the same virus. "Chicken pox is something that needs to run its course," said Dr. Silecchia. "There really is no treatment except for the complications that may arise as a result of having chicken pox such as a staph infection which would be treated with antibiotics. In children with weak immune systems, a doctor may consider using an antiviral agent." The incubation period (time between exposure to the illness and the appearance of symptoms) of chicken pox is 10 to 21 days. It is contagious for about six to eight days after the rash appears or until all of the blisters have dried out. There are usually no symptoms before the rash occurs but occasionally there is fatigue and some fever in the 24 hours before the rash is noticed. Children can go back to school if they have no fever and all the lesions have crusted over. Chicken pox is most contagious the day or two before the lesions pop up. Dr. Silecchia recommends children receive a chicken pox vaccine to prevent the illness and she warns that it's important that people don't get it later in life, when chicken pox can be very serious.